This artwork was used for the outer cardboard box which contained the 3 tapes which made up the 14 episode 23rd season. Despite being constructed in a manner based loosely on Charles Dickens’ ‘A Christmas Carol’ those three story strands are each represented in the artwork, by Drathro, Sil and a Vervoid. In addition the over-arching plot concerning the trial of the Doctor is also represented with the inclusion of the Valeyard. It is the image of the Valeyard which gets the cover on this list. The detail and visualisation of the three alien creatures is excellent but it is the way that Michael Jayston’s eyes appear to be piercing from the surface, staring out at the viewer which makes this design notable. It also features a very strong image of Colin Baker, resolute and focused, indicating the severity of the predicament in which he finds himself in during the story. Although this story is not highly regarded the VHS cover designed by Colin Howard is excellent. Kroll looks imposing, dominating the frame and towering over the Doctor and Ranquin in a far more convincing manner than is achieved during the story. It is also one of few artworks where the artist manages to portray the environment in which the story takes place. In this case the long grass, rising to above Tom Baker’s waste, and the watery swamp give you a feel for the story without knowing any of the plot. It is also always appreciated when we get images of the lovely Mary Tamm, in her penultimate story on Doctor Who, this time looking over the Doctor. Again, not a widely regarded story but once more Colin Howard manages to deliver an impressive piece of cover artwork. What makes this piece so succesful is the image of the Doctor and Mel, wrestling with the pool cleaner robot. The expressions and grimaces are incredibly accurate, you can practically hear Bonnie Langford screaming. Similarly the Chief Caretaker, the wonderful and much missed Richard Briers is also beautifully included. Other notable details such as the deterioration on the tower blocks and the water also add to the overall appeal of the cover. The shape of the cover is also broken up with a curve outline, something not seen on other artwork. This is the only video cover which was released after 1996 to make this list. After the Paul McGann TV movie was broadcast the BBC decided to change the style in which video covers were made. Instead of commissioning artists to create a unique piece of artwork, digital photomontages were used instead. The majority of these are largely uninspiring and insipid with very little flair. However, this example for Planet of Fire does get onto the list. The strength of it lies in the realistic effect of the flames engulfing the leading characters. Although it is not particularly representative of the product of the story but it certainly matches the title. This cover equally features all three of the lead actors from the story, including in her first appearance The Rani, played by the effervescent Kate O’Mara. Anthony Ainley also makes the cover along with Colin Baker. One of the strongest features of the artwork is the background, the green star field permeating across the cover. Although hidden by text we also see the Rani’s Tardis console. This was a fantastic design featured in the story, which sadly did not return. Instead of the hexagonal shaped console we’d seen since 1963 this console was circular, with a central time rotor constructed of conjoined hoops. Other features also include Stephenson’s Rocket, which doesn’t feature as predominately as the mine shaft that is used for the cliff-hanger of Part 1. Colin Baker’s Doctor features centrally in the composition. This is one of the earliest video releases, only the 7th title, from 1986 and as a result it has a simple photo montage cover design. Although simple, featuring only Daleks in a strong ‘V’ formation it actually suggests a story featuring lots of the evil pepperpots from Skaro. However, this is something which ultimately the story doesn’t deliver. The artwork features five Daleks, but the story only sees three make an appearance but this shouldn’t be looked on as a negative. Video artworks for Dalek stories often mean them sharing the limelight with their Time Lord nemesis or the Exillons or Davros, a trait which continued into the DVD range. But on this occasion the cover is all about the Daleks, they fill the frame, menacing in their formation. As the most successful alien creation on the show it is only right that they take centre stage for once. This is Andrew Skilleter’s first entry onto the list, an individual synonmous with Doctor Who artwork. He produced covers for the Target and Virgin novels, plus the iconic Five Doctors Radio Times cover. This particular example for the Deadly Assasin is very strong. Tom Baker is the central focus and his facial features are captured perfectly. Equally well realised is the decomposing Master, his creepy elongated fingers stretching over the Doctor. The shadowed figure of Goth also replicates a strong image seen during the story, as is the triangular sights. Also included is the seal of Rassilon design which is subtle with Tom Baker taking the central focus with the threatening Master looming over him. Stories of Doctor Who from the 1960’s were produced in black and white and the video covers refected this. However, there was the possibility to include some colour and in this case the colour was included in the realisation of Rapunzel. The golden hair brings life to the artwork but that does not mean that the rest of it is lacking in any way other than colour. The Mind Robber is a story with a lot of different elements and the majority of those are reflected in this cover. The white robots and Medusa are incredibly detailed and the addition of the clockwork robots and unicorn add more strong visual elements. Also of note is image of Patrick Troughton, with his hair taking a lot of the plaudits which always reflected his ‘cosmic hobo’ characterisation of the role. Although not a highly regarded story Warriors of the Deep did see the returns of both the Silurians and their sea dwelling cousins. The colour of the artwork, a deep green, reflects the deep ocean floor where the story takes place, specifically the sea base, located appropriately at the bottom of the composition. Whether you agree with the redesigns of the two main monsters or not one has to admit they do look impressive on this cover with exquisite detail. Even the Myrka looks intriguing, a creature which failed to deliver on screen but seen in an appropriately selective way. The Silurian ship adds balance to the composition with the Doctor taking centre position. However, the image of Peter Davison is clearly taken from a still taken during the production and doesn’t work effectively on the cover, his eyes looking in the general direction of the Sea Devil but not specifically at him. This is a brilliant cover. Simple in it’s construction but incredibly effective. Realeased in 1989 it demonstrates how the compositions improved gradually over time from the Day of the Daleks release with more elements being added and the overall composition improving. This cover includes a great image of Tom Baker, looking delightfully apprehensive and also has the space station Nerva, orbiting the planet Earth. However, the absolute success of this cover is the Wirrin. An alien creature, brilliantly depicted, lurching and threating over the whole planet. It is a very evocative image and works beautifully. The text at the bottom is also placed properly, all other releases having in centrally which often obscures parts of the design. That method could actually have worked on this cover but the fact it is moved over to the bottom right corner balances the whole image very succesfully. This is a great cover which would’ve caught the eye of any shopper at their local video store. Largely this is because of the rich purple background which doesn’t correlate to anything seen in the story but works perfectly with the rest of the configuration. Both Jon Pertwee’s Doctor and Roger Delgado’s Master are perfectly brought to life, Pertwee’s hair and Delgado’s goatee beard in particular look fantastic. The Autons also get a respectable presence with the faceless Auton policeman looking menacing and the oversized carnival mask equally prominent. The centre image of the radio telescope signalling to the Nestenes is an interesting selection but does provide an adequate focal point to the composition. This cover is one of a few which featured both on the VHS release but also as the cover to the Target novelisation. As discussed previously, it was an executive decision that the covers for 1960’s Doctor Who stories must reflect the black and white nature of the video material. As a result the design was largely monochrome but still has fantastic creativity. The blending of William Hartnell and Carol Ann Ford’s faces is beautifully executed and rightly receives the focus. Hartnell in particular is beautifully captured. The bottom of the frame recreates an iconic moment from the closing seconds of the very first episode, the TARDIS landing on the unknown landscape. This is picked up brilliantly with the TARDIS itself being in colour, the prominent blue standing out from the rest of the composition despite the fact it would obviously have been monochrome on the video. This is a fantastic piece of artwork which just so happened to be used as a video cover. The incredible highlight is the visualisation of the recursive occlusion seen during the story. Such an abstract image must have been incredibly difficult to achieve but is pulled off spectacularly with the Fifth Doctor moving through the myriad of staircases. The image of Peter Davison in his first televised appearance as the Doctor is suitably prominent, even if his hair doesn’t seem as blonde as in real life. Anthony Ainley’s Master also gets an appearance, firing his TCE weapon and his TARDIS also stands at the top left corner of the composition. The colour is also very strong and rich but ultimately the quality of the artwork is in the abstract recursive occlusion visual. Missing, presumed dead! Returned to BBC Video after over 20 years. When Tomb of the Cybermen was discovered in Hong Kong in 1991 it was a moment of celebration for Doctor Who fans. At the Doctor Who celebration at Longleat in 1983 a poll was taken for the first title which fans would like to see released onto video. Tombs won. But because it wasn’t in the archive any longer Revenge of the Cybermen was released instead. However, in 1992 fans could finally own the Tomb of the Cybermen and watch it as often as they liked. 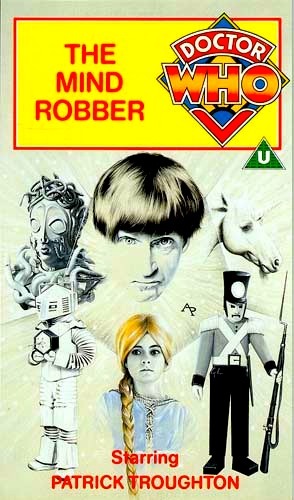 The artwork for the release appropriately features the iconic image of the story, the Cybermen breaking out of their tombs. This is my all-time favourite Doctor Who video cover. It features one of the most iconic images of Jon Pertwee’s Doctor, a photograph taken during the making of this story with a Sea Devil reaching for his shoulder, which incidentally I have framed and on my wall at home, much is my fondness for it. Pertwee’s facial features and expression are captured perfectly. Similarly, the legendary Master, Roger Delgado features in the artwork and is visualised expertly, holding his calling device which adds another detail, as does the prison castle. The real highlight however is undoubtedly the Sea Devils. It is not very often that we were treated to multiple versions of the same monster on a cover. But in this case we have a trio of Sea Devils, all from different angles providing a more rounded view of these iconic monsters. The background is an appropriate blue colour; highlighting the nautical nature of the adventure but for some reason the DVD release had a pink colour scheme. Overall, it is one of the best examples of the amazing artwork created by a series of talented artists for the popular VHS releases, showcasing fantastically captured Doctors, villains and monsters in beautiful compositions that will live long in the memory.